A solvent dye is a dye soluble in organic solvents. It is usually used as a solution in an organic solvent. Solvent dyes are used to color organic solvents, hydrocarbon fuels, waxes, lubricants, plastics, and other hydrocarbon-based nonpolar materials. Fuel dyes are one use of solvent dyes. Their molecules are typically nonpolar or little polar, and they do not undergo ionization. They are insoluble in water. We deliver safe, reliable and effective chemicals that are manufactured under the close surveillance of industry experts. We have well connected offices across India and can serve our customers within short span of time. In order to minimize the environmental, health and safety hazards, we formulate our chemicals and dyes with utmost attention. 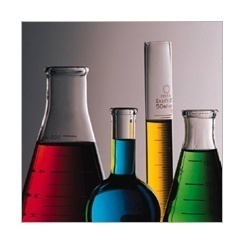 Our clients can source chemicals and dyes per their specifications in competent rates as, we are soundly calibrated to deliver "Customized Products".